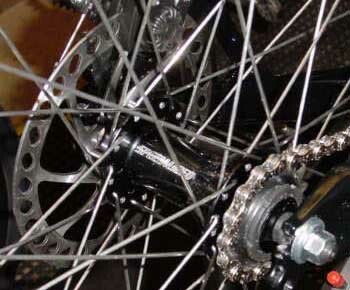 one that forces you to fan the pedals to keep up with the speed of the bike. Your goal is to rev your legs as quickly as you can while remaining seated. At first, you'll probably bounce a lot on the seat. But, with practice, you should be able to stay in the seat and maintain a calm upper body even though your legs are spinning at supersonic speed. If you do this drill a lot, your pedaling speed and efficiency will quickly improve. rear), with a rubber belt connecting the front drum to one of the rear drums. You put your bike on the rollers and start to pedal and you can balance and ride just like you do spinning down the road outside. Most rollers have optional equipment that allows increasing resistance because there isn't much drag from just the roller unit itself. your energy goes into driving the bike. Think they're just for roadies? Actually, the concentration and spin improvement builds confidence and the ability to ride tight singletrack, maintain your balance in slick mud and skirt narrow ledges high in the mountains, too. A classic cycling trick to improve pedaling technique is riding a fixed-gear bike in the winter. Constant pedaling is required because you can't coast. And you must accelerate pedal speed on downhills because you can't shift. 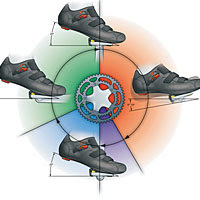 These factors combine to smooth your pedal stroke and force you to spin complete circles. Pick ride routes that avoid steep climbs and descents. You don't need to buy a new bike to pull this one off, either. A threaded-hub wheel, a track cog, a BMX chain and a few axle spacing tricks can turn your regular bike into a fixed-gear rig. We can help with the conversion. If you're one of the privileged few who can ride a track bike at a velodrome (a circular, banked track for cycling), you'll reap the same benefits as training on a fixed-gear bike. Never ride a track bike on the road, though. Brakes are a must on the street, and track bikes don'thave them. Make Sure You Check Back Often For More Cycling Tips! Or, you can Like Us on Facebook and Follow Us on Twitter So You'll Never Miss An Update! Come to Scheller's Fitness and Cycling for all your cycling needs. We have 4 great locations in Kentucky, and 2 in Indiana to serve you best!